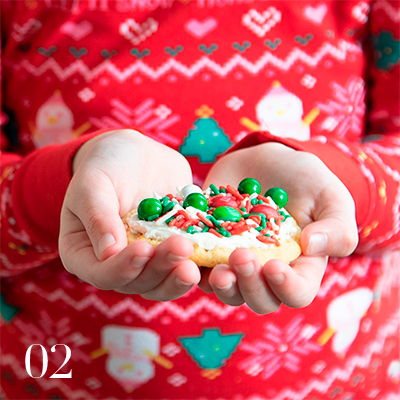 What’s the holiday season without copious amounts of snacking, crafting, and time spent with family? We threw a party that celebrates the best of the holiday season in fun, family-friendly fashion. 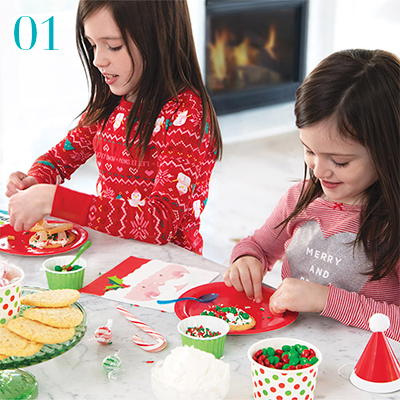 So, without further ado, here’s a Christmas cookie decorating party that’s not only fun, but delicious too! A tray of plain sugar cookies, loads of icing, and a few festive toppings are all you need to ensure your kids have a blast creating their own sweet treats. To set the stage for all this culinary magic, we placed bowls of white icing along the table complete with a plastic knife for easy spreading. 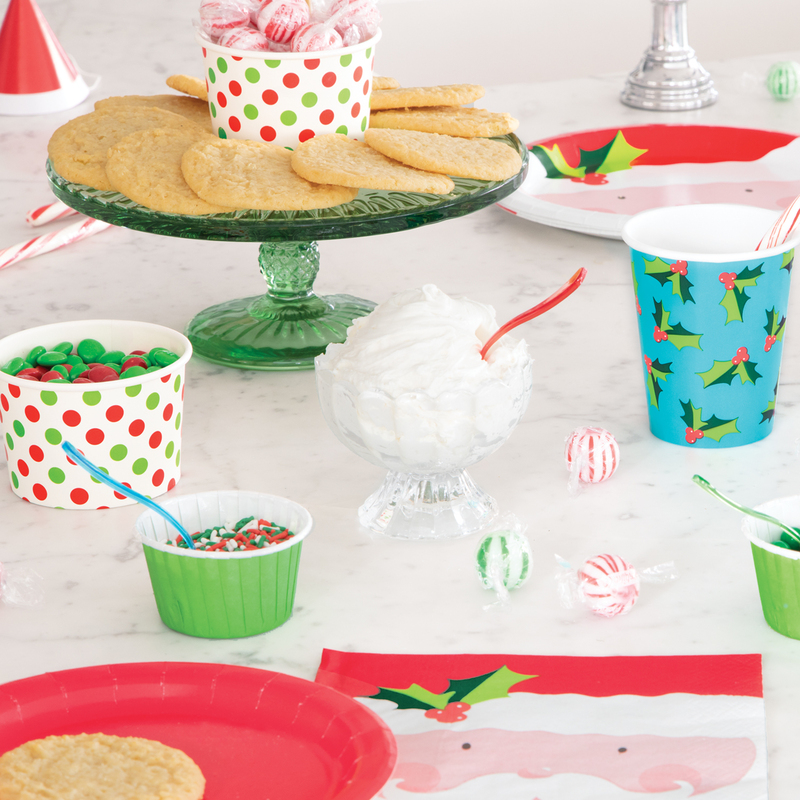 Then, we filled our Green Candy Cups and Red & Green Polka Dot Ice Cream Cups with delectable toppings such as sprinkles, chocolates, and gum drops. Finally, we let the party elves loose! While our young pastry chefs were hard at work decorating their Christmas cookies, we served up some delicious hot cocoa in our Holly Santa Paper Cups with candy cane garnish to keep the Christmas spirit strong. 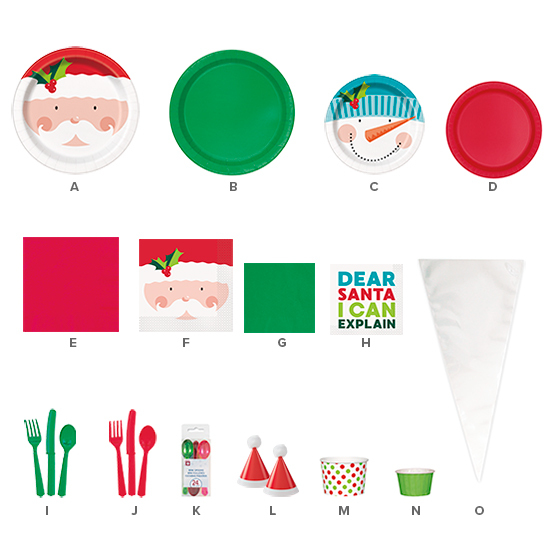 Our Holly Santa Paper Napkins and Plates made it easy to keep creative messes to a minimum, and cleanup a breeze. 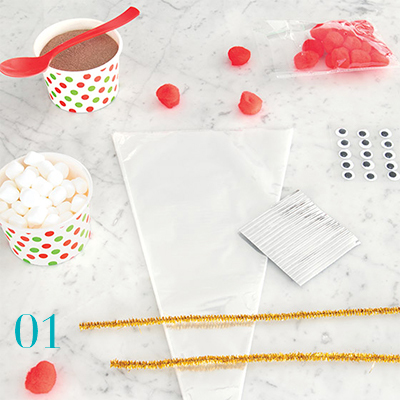 Have your guests fill up their cellophane bags halfway with hot cocoa powder. Then, sprinkle on some crushed candy cane and top it all off with loads mini marshmallows. Pinch and twist the open end of the cellophane bags and secure it with the included twist ties. Your guests can then give their reindeer colorful antlers with pipe cleaners. Finally, glue on the googly eyes and pom-pom nose, and voila! 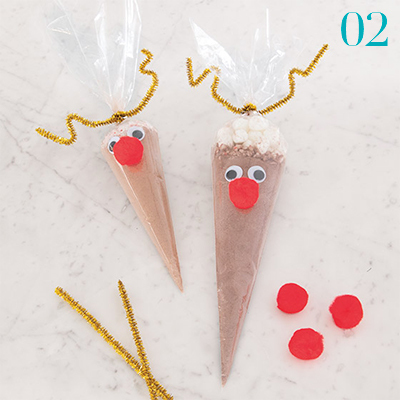 These reindeer favors are sure to have your guests shouting out with glee. Hop on your nearest toboggan, snowmobile, or reindeer and pick up all of our Holly Santa Christmas party supplies from your local party supply store. Snowed in? No problem! You can check out all of our holiday party supplies online too!